I got an e-mail containing a response to my post on stem cell research from earlier this week. I posted the response at Multi-Level Political Debate. This goes beyond the realm of parody. This is an outright lie. The vast majority of ESCR opponents fully support the use of stem cells taken from adults or umbilical cord blood, and Trudeau knows it. What ESCR opponents such as President Bush and I oppose is the destruction of human embryos in order to get those stem cells. If stem cells can be harvested in a non-destructive way, we would be all for that harvesting. Dawn Nissen asks in her editorial, given the number of people who are suffering, "With this many people suffering, can this be humanity and morally right to let them suffer?" No, it is not morally right to let them suffer. Medical science should look for ways to help people suffering from diseases and disorders, and one of the methods of doing that is using stem cells taken from adults, umbilical cord blood and so forth. Opponents of ESCR are not advocating an end to scientific research to help sick people, but that we should not sacrifice one human life to save another. The date that Josef Mengele arrived in Auschwitz is irrelevant. The point is that Mengele experimented on human beings. Scientists doing "research" on embryonic stem cells destroy human life in the course of their experiments. I suppose at this point it would be a good idea to explore the question of when life begins. Sperm cells or egg cells, by themselves, do not constitute a human life. When a sperm cell meets an egg, it forms a new life, complete with a new DNA sequence. Once formed, all a human embryo needs to grow and develop is time, nutrition and shelter. If that embryo is not naturally aborted or murdered in an abortion clinic, he or she will go through the stages of life. A human embryo is simply a stage of life, much like being a toddler, teenager, or elderly person. Scientifically, there is no question when human life begins and no amount of screeching from the pro-abortion camp will change this. When supporters of legalized abortion recognize that they have lost that argument, they try to shift the focus to "personhood". At what point does a human embryo or fetus become a "person" worthy of legal rights? Obviously, there is a difference of opinion here. Pro-abortion fanatics like U.S. Rep. Julia Carson (who voted against a bill that would make it illegal to kill a baby after he or she is born) would draw the line of "personhood" much later than I would. Tim Bayly made a good analogy on his blog to hunting; Mike Adams has made the same argument many times in his syndicated column. When a hunter sees something in a bush, he does not fire first and then determine whether his target was a deer or a human being. If we are to make an error in a moral society, we should err on the side of protecting life and not decide to kill something that may or may not be a "person". Personally, I reject the idea of determining whether to protect human life based on a nebulous (and changeable) concept like "personhood". There was a time in this country where blacks were not considered to be "persons" in the same sense that whites were. It makes no sense to draw an arbitrary line at a certain point in the pregnancy or even detecting brain waves. Why is the fetus/baby not a person two days or a week before that point? The line should be simple and clear: from fertilization onward, innocent human life is not to be destroyed. Nissen argues that not everyone believes in the Bible. This is true, but not everyone agrees with fundamental moral positions that society almost universally holds. Some people believe in pedophilia while others believe a man should be allowed to physically abuse his wife in order to "discipline" her. Should society abandon laws against such things because there is disagreement? How large does the minority have to be for extreme views to be taken seriously? Even if a majority of the people believed in spousal abuse, would that make it right? Nissen writes, "it is time we stop asking a question of morality." That is something we just cannot do. There have to be moral boundaries. This is why medical professionals have taken the Hippocratic Oath for thousands of years, because the power over life must be governed by ethics and morals. Josef Mengele did not ask "a question of morality" when he was torturing people in Nazi concentration camps with his experiments, and we find his "research" universally repulsive. To say that the President's veto of federal funding for embryonic stem cell research "demolished the hope for people with diseases" is unnecessarily hyperbolic. 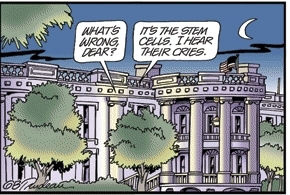 As I have said several times, there are other sources for stem cell research, and adult stem cells have already proven themselves to be far more useful than embryonic stem cells.